Leader of the Christian Democratic Union (CDU) and the acting German Chancellor Angela Merkel and Social Democratic Party (SPD) leader Martin Schulz shakes hands before exploratory talks about forming a new coalition government at the SPD headquarters in Berlin, Germany, January 7, 2018. Photo by Reuters/Hannibal Hanschke. September's watershed elections left Merkel without a majority, while the SPD suffered its worst post-war score. 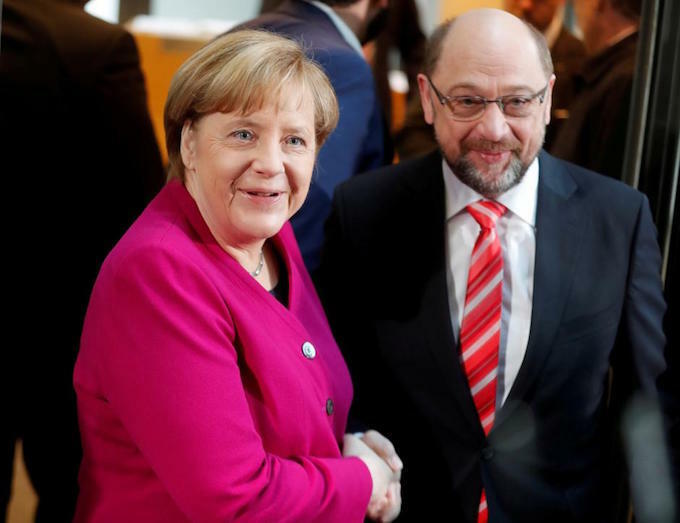 Chancellor Angela Merkel and Social Democrat chief Martin Schulz on Sunday vowed a new style of politics for Germany, as they opened talks on renewing their coalition to shake Europe's biggest economy out of political paralysis after September's inconclusive elections. The week of meetings between Merkel's conservative alliance and the Social Democrats (SPD) will examine whether the two sides have enough common ground to begin formal coalition negotiations towards a new government by March or April. Merkel voiced optimism about going forward with the SPD as she went into the talks at the center-left party's headquarters, saying "I think that it can be done". "We will work very swiftly and very intensively," the veteran leader added. Speaking on behalf of Merkel's CDU, her Bavarian allies CSU as well as the SPD after the first day of talks, the center-left SPD's Lars Klingbeil said: "The three party leaders made it clear in their opening statements that given the election results, we can't just go on as before." "The global political situation, the situation in Europe, the composition of the German Bundestag, all that show that we find ourselves in a new era. And this new era needs new politics," he said, adding that "a new political style" was also required. September's watershed elections left Merkel without a majority, while her junior coalition partner, the SPD, suffered its worst post-war score. Meanwhile the far-right, anti-immigration Alternative for Germany(AfD) captured more than 90 parliamentary seats -- the best showing for a far-right party since the end of World War II. The AfD capitalized on growing misgivings over more than a million asylum seekers who have arrived in Germany since 2015. Questions surrounding the new arrivals could yet prove to be sticking points as Merkel seeks a new deal with the SPD. Anxious to stem the haemorrhage to the far right, the conservative wing of her party as well as her Bavarian CSU ally are championing a tougher stance on immigration -- including demands that are unpalatable to the SPD. With an eye on a regional election in Bavaria later this year, where current polls show that the CSU could lose its absolute majority, the party wants financial handouts to asylum seekers reduced. Following several violent crimes involving refugees of uncertain age who claimed to be minors, the CSU party also wants medical tests to determine if adult migrants are posing as under-18s. Nevertheless, CSU chief Horst Seehofer voiced his determination to find a deal with the Social Democrats. "We must find an agreement," he said Sunday as he entered into the exploratory talks. Schulz meanwhile signaled his party's determination to extract key concessions on social welfare reforms. "We're not drawing any red lines, but we want as many red policies in Germany implemented as possible," he said, in a reference to the SPD party's color. The Social Democrats had initially vowed to go into opposition, but the collapse of coalition talks between Merkel's alliance and the smaller pro-business FDP and the left-leaning Greens parties pushed the SPD to reconsider. Any deal would still have to be put to a vote of the SPD rank-and-file, and the leadership has been at pains to stress that talking with Merkel's conservatives did not automatically mean a new grand coalition. The talks are "open-ended," said one of the SPD's negotiators Michael Groschek, reiterating the party's stance that the discussions could also lead to tolerating a Merkel-minority government. As the two sides square off at the negotiating table, the parties have agreed to decline media interviews, with publicity limited to joint statements. The decision is aimed at preventing a rerun of Merkel's previous failed attempt at forging a coalition late last year, when interviews given by negotiators soured the atmosphere. Latest opinion polls suggest however that a potential new grand coalition enjoys little favor with Germans. A survey published by Focus magazine found that 34 percent of Germans would prefer fresh elections, while only 30 percent favor a return of the conservative-SPD alliance. Another poll published by public broadcaster ARD found that only 45 percent of Germans view a new grand coalition positively, while 52 percent consider it a bad option.